$49.95 In stock. Order in the next 13 hours, 16 minutes and it will go out today! In stock. Order in the next 13 hours, 16 minutes and it will go out today! It's time to get your act together, and Scott Alexander is here to show you how! 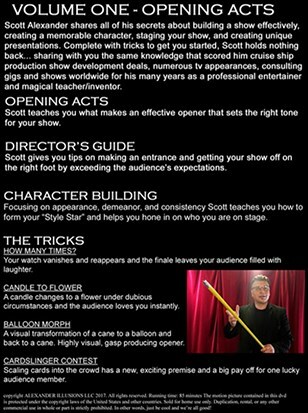 In his new DVD series, Scott gives you the secrets for putting together your own show. Volume 1 concentrates on the opening act. 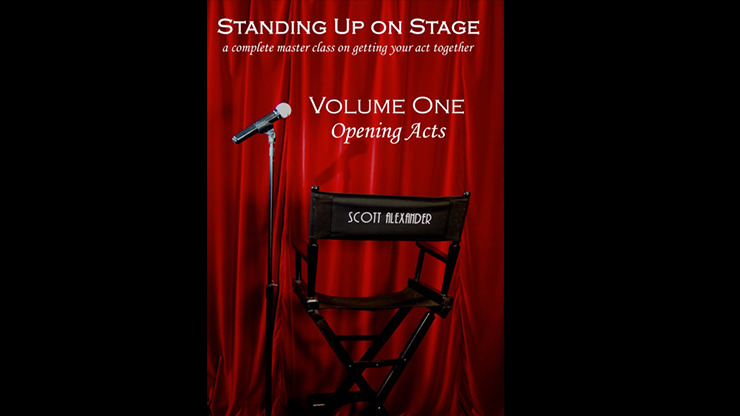 It includes tips on making your appearance onstage, grabbing audience attention and not letting go, and development of your character and motivation. HOW MANY TIMES? : Your watch vanishes and reappears, with a comedic finale they won't see coming. CANDLE TO FLOWER: A candle changes into a flower under dubious circumstances, but the audience will love it. BALLOON MORPH: Change a cane to a balloon, and back again. Quick, visual, and bound to impress. CARDSLINGER CONTEST: Throwing cards into the audience has a big payoff for one lucky member. So quit performing a set of tricks and calling it a show. It's time to get you act together for real! Buy your copy today!